Your journey into learning more about how to leverage the power of the MONTAGE Super Knob continues in this lesson where you learn about "morphing". Listen closely as you morph from all harmonics (Saw) to just the odd harmonics (Square) and back - slowly turn the Super Knob from minimum-to-maximum and slowly return. You will continue to hear and identify the odd harmonics as you morph the Square Wave back into the Sawtooth. It is as if the Square Wave hides inside the Sawtooth Wave - and indeed by this morphing action we are changing the harmonic content of the sound, but in a very different way than you could do with Filter. A Filter works to remove all harmonics above (LPF) or below (HPF) a center or Cutoff Frequency. Use the second row MUTE buttons to isolate each Part, in turn, to convince yourself that you are actually turning the Saw down as you turn the Square up. The Controller matrix of the MONTAGE is huge. This is why we are starting slowly. 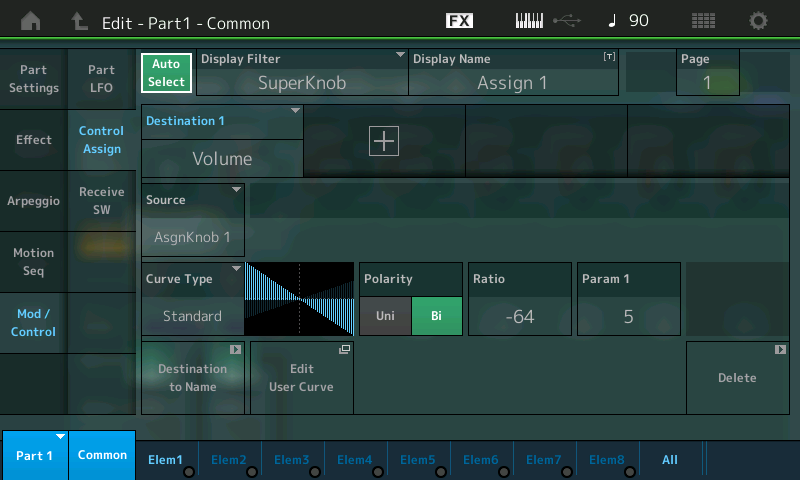 The Super Knob, on the upper Common level of the architecture, can have 16 parameter Destinations (1-16); Additionally, each Part can have its own 16 parameter Destinations. The Super Knob can control its 8 AssignKnobs and each Part has its own 8 AssignKnobs. Let's begin by seeing how the Sawtooth Wave that we hear when we initially recall this sound, is turned down by the Super Knob, and the Square Wave in Part 2, which starts silent, is turned up by a single gesture. • Highlight the PERFORMANCE NAME: "Super Knob Morph A"
• In the screen select "Control" (left column of the screen) > "Control Assign"
You can view both of these assignments by touching the DISPLAY FILTER and setting it to "ALL" or by moving the "SUPER KNOB"
The Display Filter simply changes what you are viewing at the current time. 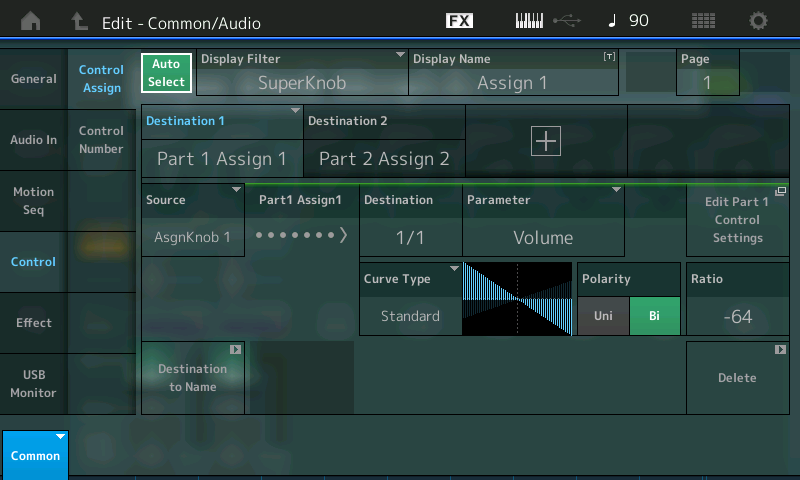 Added in version 1.60, as you move the Super Knob with "Auto Select" active, you can review all parameters linked to the Super Knob. "Destination 1" is the currently selected item (it's blue). Move the cursor to highlight "Destination 2". Highlighting each assignment in turn will allow you to review "how" the controller movement is being applied. • The screen will read "Edit - Part1 - Common"
This will light the lower [COMMON] button for ELEMENT/OPERATOR. If not, it means you were last viewing an individual ELEMENT, press the lower [COMMON] button which is also found in the lower left corner of the screen (blue). 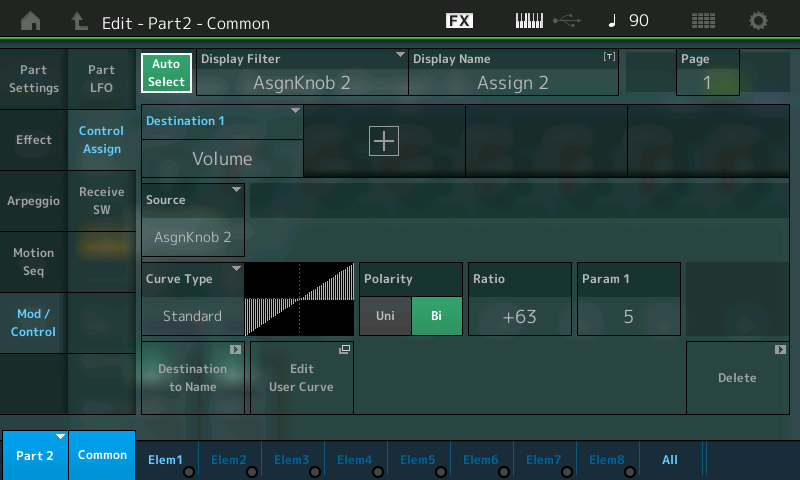 • Select "MOD/CONTROL" (left column of the screen) > "Control Assign"
• Press the [PART SELECT 2/2] button; or touch where it shows "PART1" in the lower left corner and select "PART2"
• The screen is now: "Edit - Part2- Common"
The Curve graphic shows (reading left to right) that as you turn up the AssignKnob 2, this PART, which starts at silence, will be turned up in Volume. In the minimum position you will only hear the Saw wave, in the maximum position only Square wave, in the center position a mix of both. These particular examples use the STANDARD Curve Type. This should be easy to follow, to hear and to understand. 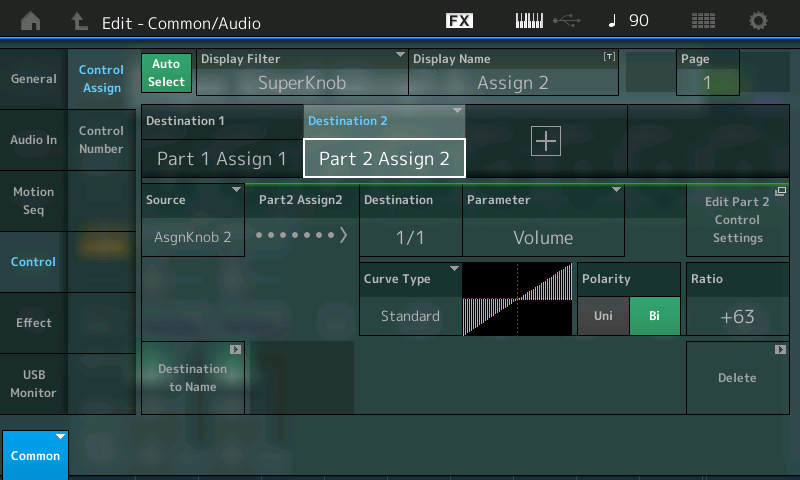 Because both the AssignKnob 1 of PART 1 and the AssignKnob 2 of PART 2 are linked to the SUPER KNOB, moving the SUPER KNOB with "Auto Select" active, will show you these same two Controller boxes. And as you move the SUPER KNOB the red indicator for the linked AssignKnob moves with it. Select [PART 1] move the Super Knob - observe the AssignKnob red indicators. Select [PART 2] move the Super Knob - observe the AssignKnob red indicators. Select [COMMON] move the Super Knob - observe the AssignKnob red indicators. The DISPLAY FILTER will recall what items are going to be changed when the Super Knob is moved. When you are viewing a PART edit screen, this is a quick way to see which parameters are being influenced and by which Controller. Simply highlight the Destination box to review/customize the relationship. Similarly, when on the upper COMMON/Audio level of the architecture, with the "Auto Select", you can quickly review the PART links to the Super Knob. As programs get more complex - this is a very important tool. Because as you will see many things can simultaneously be linked to movement of the Super Knob. This Display Filter--Super Knob recall feature, makes it much easier to sort through deeper complex Motion Control programs. For now, just recognize that the Auto Select function helps you *Filter* the data that is recalled to the *Display*. The Display Filter can show everything assigned to a specific SOURCE (Controller). • Highlight the PERFORMANCE NAME: "Super Knob Morph B". • Touch "MOTION CONTROL" in the screen just under "HOME". • Touch "SUPER KNOB" in the second column. • Touch "OVERVIEW" top of the second column to view the routing scheme. • Change the "PART" from COMMON to "PART 1" to view the assignments to PART 1. • Touch the box "Edit PART 1 Control Settings". This will take you directly to the PART 1 Controller setup... Now you can toggle between PARTs 1 and 2 using the PART SELECT [1/1] and [2/2] buttons on the right front panel. Try manipulationg the shape of the Curve by highlight "Param 1" and altering the value. Navigating back and forth may, at first, seem to be a chore (because you must select the PART and then move the KNOB in order to view what you want) but as you begin to recognize that each PART has its own set of functions the power of this is revealed. Spending time navigating and experimenting here will be well rewarded as you get used to just how deep "scuba diving" with Montage can get! 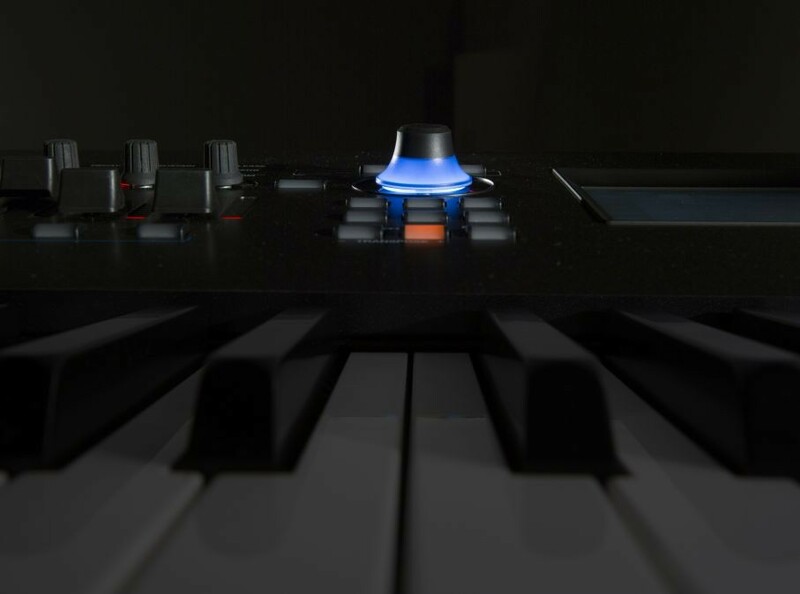 Try to avoid applying AFTERTOUCH while viewing the ASGN KNOB 1/ASGN KNOB 2 with the "AUTO SELECT" option active. This kind of access to parameters and controllers is the equivalent of 'patching' analog synth modules together to make a voltage control sound. This is the first step into the MOTION CONTROL SYSTEM. Catch up on the previous article in the series - "Mastering MONTAGE 4: Super Knob Bipolar" here. Next article: "Mastering MONTAGE 6: Super Knob Complex" here. “Music in Motion. Welcome to the new era in synthesizers from the company that brought you the DX and the MOTIF. MONTAGE sets the next milestone with sophisticated dynamic control, massive sound creation and streamlined workflow.” This is the first statement found on our website to introduce you to our new and remarkable flagship Music Synthesizer, MONTAGE.